Featuring Amy Lee, Will Hunt, Troy McLawhorn, Tim McCord, Jen Majura, Will B. Hunt, Dave Eggar, Susie Selter, David Campbell and Steve Trudell. Distributed by Eagle Vision. 130 minutes. Not Rated. Soon after the hits, the band started a series of lineup shake-ups and extended group sabbaticals that have continued to the current day, to the point that the band has only released four albums in the 16 years since Fallen. All those albums have all done well, but the extended time between records has slowed their popularity a bit. Still, they still have quite a core following. Lee has become a mother and had some major lifestyle changes since she was briefly the unofficial queen of goth. She has done a few solo albums, some soundtrack work and performed with other artists, experimenting with genres and styles. Hell, she even did a solo album completely made up of lullabies for children in 2016. At this point in the band�s history, when she goes back, Evanescence is to Lee as the Pretenders are to Chrissy Hynde: The frontwoman and whatever guys (and gals) she happens to bring along for the ride. Only Lee remains from the original lineup, or even from the Fallen/Anywhere but Home breakout period of 2002-2005. Other than Lee, the longest-tenured band member is bassist Tim McCord, still around from the 2006 third album The Open Door. Drummer Will Hunt was new to the band on their self-titled fourth album when I interviewed him about the group in 2010, and he�s also still with the band. The two guitarists are both newbies, first becoming bandmembers during the recording of the 2015 album Synthesis, their most recent release, which this tour video celebrates. One slight complaint about the setlist is that they do tend to dip a little too liberally into the then-current album, which is arguably Evanescence�s least-known recording, but that has to be expected on a concert stage. Still, Evanescence�s shining moment � and the song which is given the subtlest orchestral backing � is the simply gorgeous �My Immortal.� Starting with just a string section and Lee�s still impressive vocals, eventually a subtle piano is mixed in. However, the song is a showcase for Lee�s ability as a singer and her voice is as strong as ever. Somewhat surprisingly for a band that only had three top-ten pop hits, Synthesis Live does skip over their third one, �Call Me When You�re Sober.� Perhaps it just is in her past and she doesn�t want to revisit it, since it was about an old, toxic relationship with singer Shaun Morgan of Seether. Besides, it is certainly not as memorable a song as �Bring Me to Life� or �My Immortal,� so while it is missed a bit, it�s certainly not a fatal loss. 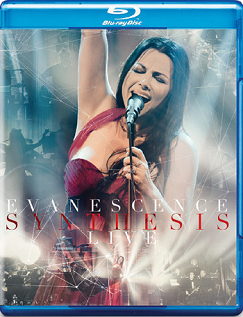 Over 20 years into Evanescence�s history � though they broke out in 2002, the band has been going since 1995 � Synthesis Live shows a group that has been fundamentally changed, and yet is still capable of surprising fans. Copyright �2018 PopEntertainment.com. All rights reserved. Posted: November 14, 2018.